By Jack Ganssle (Reviewed March 2012) Summary: Jack has been evaluating tools for monitoring current consumption of low-power systems. Here's another. ARM processors have an optional macrocell that can sample the program counter at a high rate of speed, time-stamp each sample, and spit the results out the serial connection. 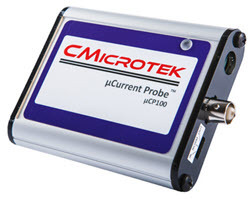 The I-jet sets up this resource and then monitors the resulting data, at the same time sampling current. Though the I-jet has a 200 KHz bandwidth, the useable resolution may be lower depending on how fast your board can push packets out. On my 72 MHz board it was very reliable at 70k samples/second, but faster data gathering led to overflows on the serial interface. That's about 14 us/sample. Fast events (again, assuming they are not integrated to oblivion by decoupling caps) could be missed. The graph shows the current going up in steps, since at each step another LED is getting turned on. The bottom window shows where I instructed the IDE to breakpoint if the current exceeds 40 mA. That happens just after calling LEDsSet to put 0xF out, turning on the final LED, pushing power to (see the current log, middle window) 42706 uA. The "while" is highlighted as that's where the current jumped to over 40 uA. Notice the "skidding" in the graph - the power went above the break value and the code continued to run for a while. Indeed, variable "i" in the watch window has incremented 40616 times after the break should have happened (it's a register variable so, at the CPU's 72 MHz, things are happening fast). Using the time stamps in the current log window it turns out the skidding lasted 12,625 us. I'm guessing the I-jet, or perhaps the PC, gets a signal that the break condition has occurred, and then sends a break command to the CPU. The skidding, though, turns out to be mostly unimportant since the code aligns almost perfectly with the current graph and log; looking back in the current log at the time stamps and PC the current jumped no more than 16 us before the first execution of the "while", which is about the resolution of the sampling interval. The skidding makes for a bit more work for the developer, but it's so easy to navigate in the graph window it's not much of a pain.